“China Goes to Sea” is in many respects a unique study. 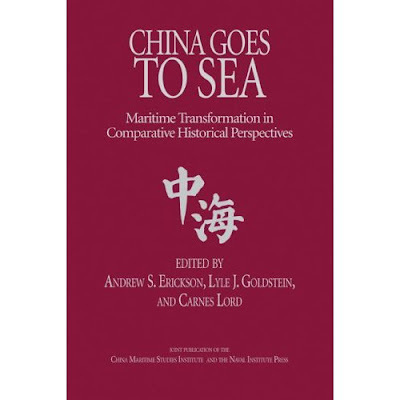 It does not only examine the Chinese “maritime transformation” (moving away from a continental/land power to a maritime/trade power), it also analyzes other maritime transformations and how they relate to the Chinese narrative. The first half of the book covered transformation attempts by other continental powers such as Persia, Sparta, Rome. and the Ottoman. The central chapters examined the experience of later continental powers such as the French, Imperial Russian, Imperial Germany, and the Soviet Union. As I expected, authors of this study spent a great deal of attention on the hard-power aspect of the transformation in the realm of military projections and doctrine. However hard-power rarely exists by itself, other areas such as politics, economics, geography, human factors, and culture were examined in detail. There is also a chapter on Shipbuilding prowess -- a foundation for a strong navy. Throughout the book, there was an undertone suggesting that "Openness" and "Trade" were essential elements for a successful maritime power (don’t forget a growing fishing fleet!) China has become the World’s number 3 in both trade volume and shipbuilding prowess. However, as Erickson and Goldstein notes: “He Shang (River Elegy) was later viewed by Chinese officials as having helped to inspire the 1989 Tiananmen Square demonstrations, however, and was subsequently banned.” For that, China still has a way to go in the “Openness” area. China goes to Sea is an impressive study with a sophisticated and comparative approach, a worthy addition to any library. It is an informative read that will please history-buffs and political-wonks alike. The Limit of China’s Influence?